Streets in the old part of Ollantaytambo are narrow, cobble-stoned, inaccessible to cars and trucks. Along one side, water flows in ancient Inca canals, still used today, no more than a foot wide. Quechua is spoken more than Spanish. Life goes on here as it has for centuries. There is no indication that less than a half mile away, a crush of tourists descend everyday on the railway station to board trains for Aguas Calientes, gateway to Machu Picchu. 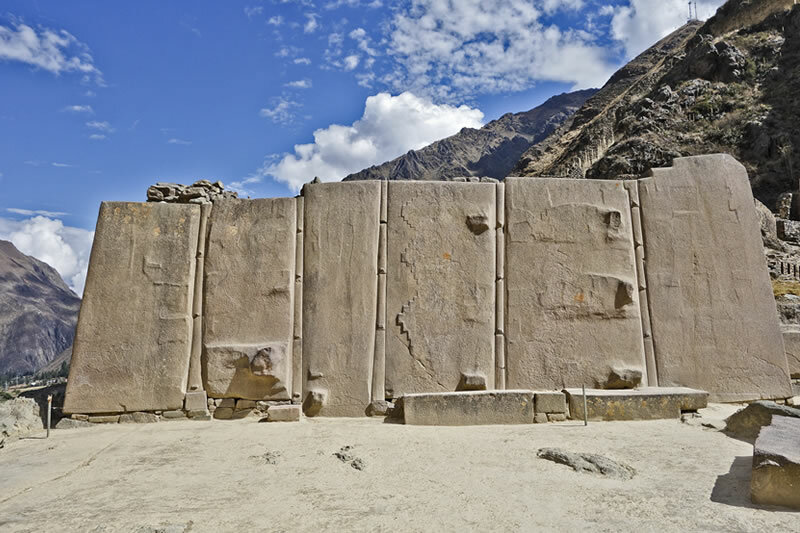 What many don’t realize is that Ollantaytambo has some of the most impressive megalithic ruins in the world. That Ollantaytambo lies between Cusco and Machu Picchu is why it gets short shrift by tourists who’d rather spend their time at those popular destinations. A shame really because Ollanta, which locals call it for short, has its own important history and architecture. The town used to be the royal estate of emperor Pachacutec. It was here in 1537 that during the Inca rebellion, Manko Inka Yupanqui defeated an invading Spanish army led by Hernando Pizarro, Francisco’s half-brother. Like a spectacular movie battle scene, volleys of arrows, slingshots, spears and stones rained down on the Spanish troops from high terraces and water flooded the valley that the Incas somehow diverted from Rio Urubamba. 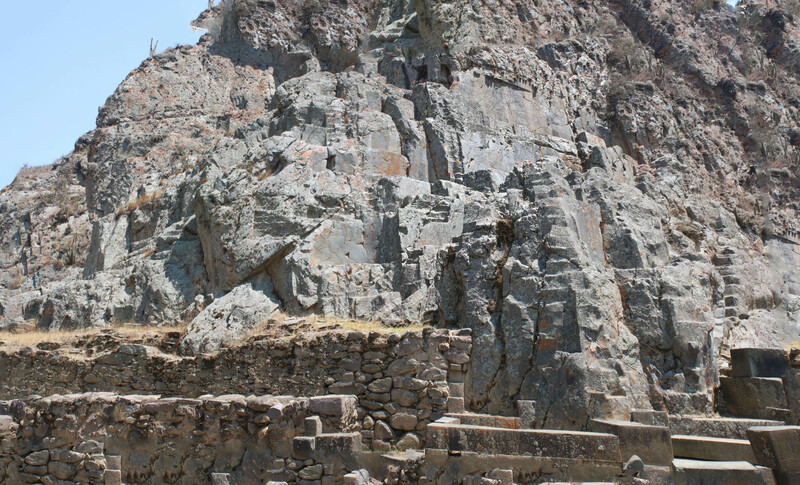 Despite the historic battle, Fortaleza de Ollantaytambo had more than a defensive purpose. This was the first town in Peru where my wife and I stayed last year (2016), following the Amazon rain forest. Like all tourists, we were here to take the train to Machu Picchu. Still, I was also looking forward to spending a day to see ancient megalithic ruins that some regard as the equal of any in the world. No matter where we walked, The Fortress, as it’s sometimes called, loomed over the entire town. The first thing I noticed was the impressive terracing (andene) that looks from the bottom like one side of a gigantic stepped pyramid, an illusion of perspective. Andenes are one hallmark of Inca engineering. A long stairway on the left side leads to the top. From anywhere along the climb, it’s easy to see why researchers think they served some agricultural purpose, much like the terracing at Moray; the surfaces are broad, deep and flat. Because they’re oriented toward the sun, it’s believed that the terraces were solar energy collectors to provide heat for crops, long after the sun set. Not only that, the resulting microclimates made it possible to grow corn, potatoes and quinoa at different altitudes. Did the Incas use these terraces for agricultural purposes? Note their scale relative to people. Near the top, we turned left to a stairway that led past incredible stonework that I saw time and again in Peru. Immense, polygonal stones were fitted together with such precision that no mortar was necessary. This section contains The Ten Niches (Diez Hornacinas). Why go to so much trouble to build a ‘fortress?’ The complex must have served more important ceremonial or astronomic functions. Stones are fitted so tightly that a razor can’t be inserted in the seams. These have rounded edges. Some edges are beveled (bottom, left). The planar surfaces are amazingly flat. Why are these stones so non-linear? The enigmatic ten niches (Diez Hornacinas) are to the left and in the topmost image. Look at the precise vertical cuts in this joinery. The Temple of the Sun (Templo del Sol) is the site’s stunning architectural achievement. Monoliths weighing up to 50 tons and rising 15ft (4.6m) high form a six-section wall made of pink granite (rhyolite), transported from the Cachicata quarry 4mi (6km) away, each stone separated from its neighbor by shim-like inserts. Again, the seams are unimaginably tight. How were these stones brought here across the 1000-ft (300m) deep Urubamba river valley and dressed so beautifully? These are not the handiwork of Bronze Age tools. Temple of the Sun (image from boletomachupicchu.com). Note the chakana pattern and the smoothing marks as if the surfaces were wet concrete. The wall might have once been part of a larger structure. Where’s the rest of it? I noticed the ground nearby littered with other gigantic pink stones. Some researchers suggest that the ‘temple’ was left unfinished when the Spanish invasion happened, others feel that the rubble was the aftermath of a massive earthquake or other catastrophe that toppled the structure long ago. Do these massive stones mean the Temple of the Sun was left unfinished or suffered a massive catastrophe? The rest of the complex consists of Inca-era walls, buildings and passageways of mortared field stones that, while impressive and extensive in scale, clearly don’t match the technical sophistication of Templo del Sol or Diez Hornacinas. Why is there such a big difference? The construction here is not as sophisticated as the Diez Hornacinas or Templo del Sol. The stones are considerably smaller with lots of mortar holding them together. We wandered through this sprawling area until we got to an area called Inka Misana. The crowds were sparse. Most visitors don’t go through this part, though it’s not far from the main entrance. More large blocks of impressively finished stone were on the ground. Equally incredible were what appeared on the hillsides. You could even say, what didn’t appear. Large cubed sections had been skillfully and smoothly removed from solid rock, with no visible gouge marks, as if the stone were cut by some sort of machinery or unknown technology. Excavations in rock, some appearing as cubed cutouts, others like stairs. The planed surfaces are flat with no gouge or chisel marks. How in the world did the builders accomplish this? Certainly not with hammer and chisel. I’ve wondered before about the different building styles at Machu Picchu. I think the same applies here in Ollantaytambo. Is it so hard to imagine that different peoples may have been responsible for the three styles, the Incas being the most recent, calling into question everything we think we know about human history and its technological achievements? Ollantaytambo should be on everyone’s travel bucket list. This entry was posted in Peru, South America, travel and tagged ancient ruins, andenes, Diez Hornacinas, Inca terraces, Inka Misana, megalithic monuments, Ollantaytambo, Temple of the Sun, Templo del Sol. Bookmark the permalink.